Putting to one side feelings that the wall should not be built, what issues would the designers face? Socially and politically, walls have been shown to exacerbate conflict. Big, tall, militarised walls tend to lead to complex and typically damaging social effects, whilst the sheer mass and presence of the walls ensures that the issues that they are intended to resolve are never allowed to go away- at best they persist in the subconscious and perpetuate antagonism with those living on the other side. Professionally, what type of designer would want to take on this job? Landscape architects get into this work for a whole range of reasons but beneath them all, we tend to do this because we want to make a difference. Across nearly every design school we are taught about environmental justice- Anne Whitson Spirn’s work at Mill Creek stands out in particular- but in practice many of us take on jobs to pay the bills. Some of them might grate but generally speaking, the work of a landscape architect is to bring environmental and social opportunities. We build all sorts of walls all the time- how would the landscape architects of this project rationalise their work? Technically, it’s a hell of a challenge- how do you militarise a landscape on this scale? 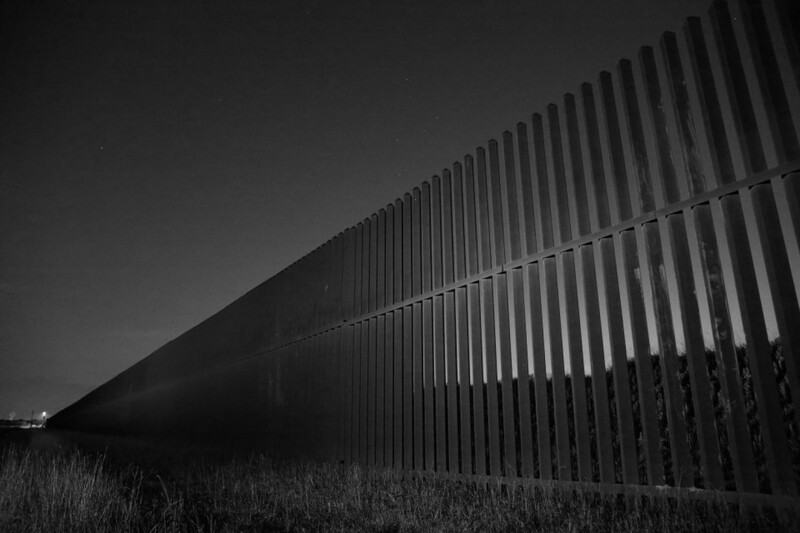 A wall is not just a wall, it includes its hinterland and buffers. In this instance, we are talking very large areas of land that will have to be sterilised to ensure that here are no opportunities for potential transgressors to hide. From another perspective, in the U.K. we’re familiar with LVIAs, but how would you begin to describe the visual envelope or the landscape character of such a hostile intervention? Walls are known to create environmental problems- the removal of the Berlin Wall, for example, was one of the greatest ecological success stories in east Germany of the twentieth century. So how would this wall maintain the passage of animals and plants? The US Fish and Wildlife Service has set out estimates of which species could be affected and as we stand on the cliff face of the Sixth Extinction, this intervention is an avoidable disaster. Financially, landscape architects are familiar with value engineering, perhaps more than most other professions due to the nature of our work. We understand cost management and regularly think quickly to find cheaper ways of delivering the spirit of the original design. Ensuring this wall meets anything approximating the budget of $12bn would be perhaps the greatest showcase of budget management seen by this generation. These five areas within our discipline are by no means the only issues with the wall but they are a useful starting point for discussion. In this spirit, I was interested to see the proposal by Domo Design Studio. Essentially a supersized haha built from shipping containers, in some ways it makes sense, reducing the visual impact and costs of construction. Aside from the willingness to engage in social conflict, it grates to see the proposal justified as ‘beautifying the border’ and described as ‘natural, sustainable border’, as if a 10m high barrier could be anything other than an ecological assault- as designers we need to hold ourselves to higher technical and promotional standards. However, Domo Design Studio were not the first to address this design challenge- I remember studying the “Inundating the river” proposal by Brett Milligan when I was doing my postgraduate course at Writtle College. 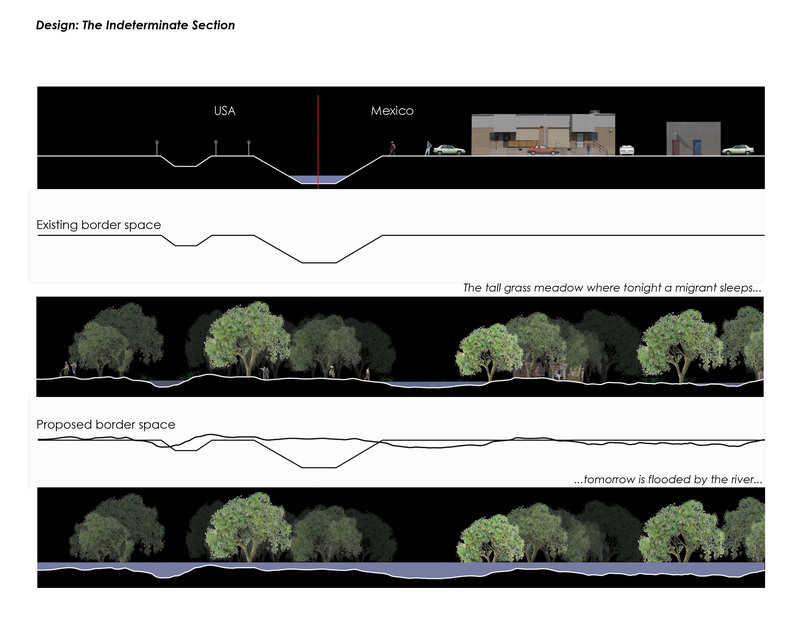 This proposal won the ASLA Student Award in 2006 and looked at Mexican-US relations long before Trump floated the idea. 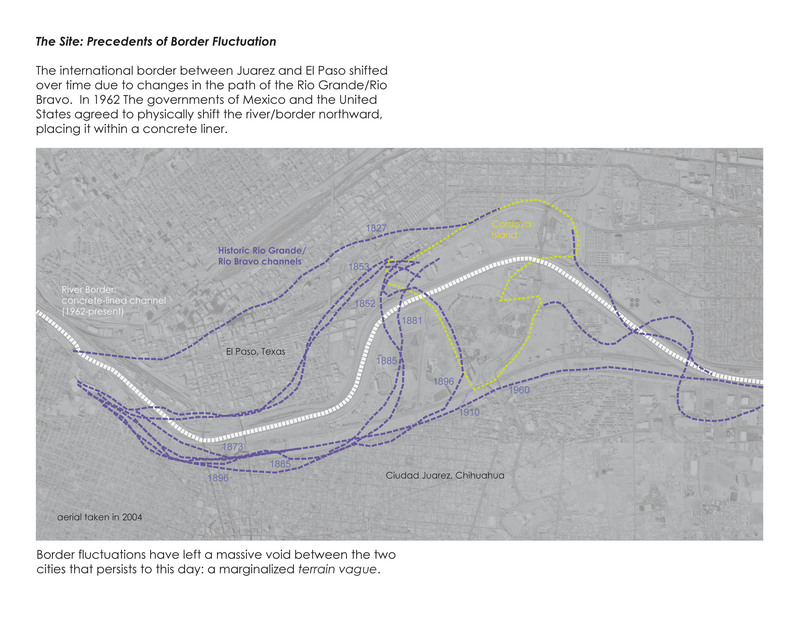 Interestingly, this proposal considered ecological and social questions equally, coming to some provocative conclusions, such as encouraging the flow of migrants at times of low water levels in the Rio Grande. I’d be interested how the designer, now Associate Professor at UC Davis, thinks back to his student project and how he would approach the design challenge now. 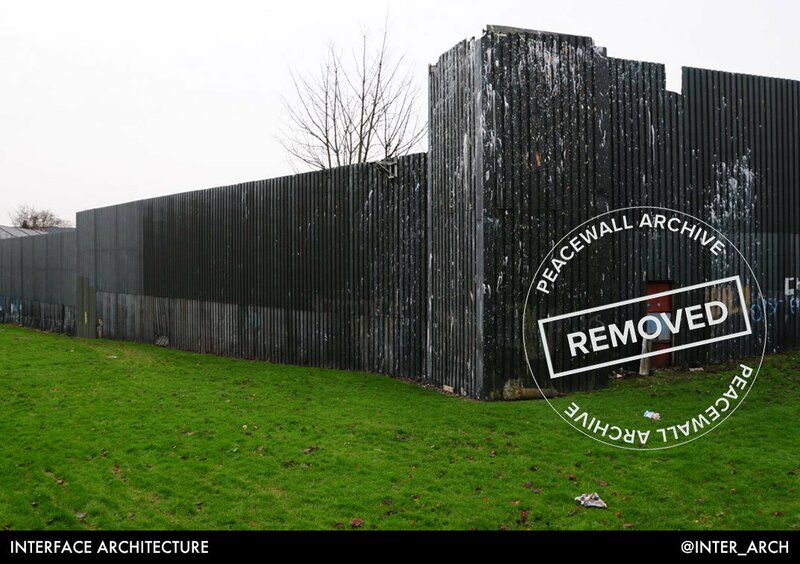 Amongst these considerations, perhaps look to the work of Interface Architects in Belfast where communities have become used to living with some of the tallest and longest-standing militarised walls in the wall. What can we learn from them? Their lessons of careful research, collaboration and consensus building is some of the most challenging and important work going on in the UK and no matter how unpalatable their conclusions might be to the new administration, their insights would be extremely useful. At the other end of the spectrum, Wakehurst Place are thinking about similar themes from a very different perspective and offer landscape architects another perspective for designing landscapes where there are rich and sometimes conflicting geo-ecological issues. Here, the opportunity to create new landscapes has been interpreted as an opportunity to discuss and celebrate cultures coming together across continents: the Silk Road and Gondwanaland are well known to botanists as being the crucible for some of the richest biodiversity the planet has known and now this internationalist approach will become the centrepiece to one of the UK’s most beautiful gardens. Of course these issues can be found to lesser (or less obvious) degrees throughout the new political climate in Western Europe, but in these times of heightened political tensions, landscape architects need to be increasingly aware of the implications of our work and the opportunities that we have to engage and work to resolve them. Few, if any, of our projects will ever be as contentious as Trump’s wall but many of the same issues apply- social justice, environmental gains, technical imagination and financial management. All landscapes are political and none of us can afford to sit these arguments out. Perhaps one theme that recurs in both the Domos and Brett Milligan’s project is that in both instances, the designers saw the border as presenting opportunities to bring people together. Even when starting from different political positions, it seems that landscape architects and architects can’t help but make spaces for social interaction, and from this we should take heart.